If you're having trouble getting a vending machine or parking meter to accept your shiny new loonie, don't kick the machine, blame the high-tech coin. The Royal Canadian Mint's new generation of loonies and toonies apparently are getting spit out regularly by coin-operated devices. 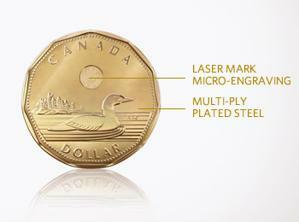 The coins, issued this month, use multi-ply steel technology that makes them cheaper to produce and provides more security features. But they also weigh slightly less than the older alloy coins and often get rejected by vending machines and parking meters. "This one didn't work," Verinder Kumar told the Toronto Star after a new loonie landed in a city parking machine's reject slot. The Toronto Parking Authority estimates that at about $345 per machine, it will cost about $1 million to upgrade almost 3,000 machines to accept the new coins, the Star reported. Calgary's Parking Authority is already spending about $30,000 to recalibrate its 770 parking machines. Vending machine operators are also bracing for an added cost to modify their equipment. "I don't know if the new coins will fit in our machines," Simo Caffe owner Jessica Seguin told the Calgary Herald. "If they don't fit, it will cost $300 to $600 per machine to upgrade the coin mechanism." The mint has been using the multi-ply steel technology in smaller coins for about a decade, causing headaches for the vending industry. "Now, every time they change the metal content of the coin, the mechanism does not read it," Ralph Burokas, who supervises servicing of 200 machines in Winnipeg for Gourmet Coffee, told the Winnipeg Free Press. Jay Toporowski, who reprograms coin machines with J-Tech Vending Sales & Services in Calgary, told the Herald the new coins will be a cost headache for the entire industry. "And later in the year we will have to reprogram again for the new $20 polymer bills," he said. The Bank of Canada began issuing the new plasticized currency last year, starting with $100 and $50 notes, with the more common $20 coming this fall and $10 and $5 bills next year. Like the coins, the new plastic currency is being touted as more durable and less vulnerable to counterfeiting. But users have reported the bills tear easily once they're creased or nicked and can melt if exposed to heat. The mint is defending its new coins. Spokesman Alex Reeves said the shift to coins that can be more easily read by vending machines has actually made life easier. The electromagnetic signal can be better manipulated on that type of coin," he told the Free Press. Although statistics are not current, the number of shaken and kicked vending machines has come down dramatically, the Free Press said. But the mint is already preparing an alternative to coins and small bank notes for so-called micro-transactions. The MintChip would be a form of secure digital currency that would allow people to transfer value from one chip to another and via devices such as smartphones.